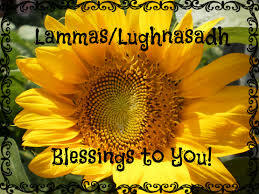 It is now high summer and the union of Sun and Earth, of God and Goddess, time for Lammas First Harvest. This runs August 1st to around the 21st. Lammas is the celebration of the first ” Grain Harvest” of the season. A time for gathering in crops and giving thanks for abundance. We work with the cycles of the seasons. Lammas is the First Harvest, Mabon or the Autumn Equinox is the Second Harvest of Fruit, and Samhain is the third and Final Harvest of Nuts and Berries. The word ‘Lammas’ is derived from ‘loaf mass’ and is indicative of how central and honoured is the first grain and the first loaf of the harvesting cycle. Even though Lammas First Harvest symbolizes abundance, prosperity, and nourishment, there’s a darker side to its presence, also. The reaper of the harvest wields a scythe that cuts the grain and lays the fields bare. Loss is just as relevant a theme during the harvest season as abundance and reminds us of the importance of balance, that for every sheaf gathered to table, a barren stalk withers in the field. Despite this, Lammas was traditionally a merry celebration — a time of fairs, hand-fastings and harvest feasts. After the harvest was safely gathered, there was a celebration sometime in August known as the Harvest Home. Perhaps you can have Harvest Home in your house!! Some of the things that represent Lammas First Harvest celebrations are listed below. And although we don’t all work the fields anymore but we can still give thanks and be grateful for our gifts. Try to incorporate some of these items into your decor or celebration to celebrate those dog days of summer. Dried grains — sheaves of wheat, bowls of oats, etc. *A quick whirl in the food processor does the job nicely. To prepare the dough: Combine all of the ingredients, and mix them till you have a shaggy dough. Let the dough rest, covered, for 20 minutes, then knead till fairly smooth. Allow the dough to rise, covered, for about 2 hours, or until it’s puffy and nearly doubled in bulk. Gently deflate the dough, shape it into a log, and place it in a lightly greased 8 1/2″ x 4 1/2″ bread pan. Cover the pan with lightly greased plastic wrap (or a clear shower cap), and allow it to rise for about 2 hours, till it’s crowned about 1″ to 2″ over the rim of the pan. Bake the bread in a preheated 350°F oven for 40 to 45 minutes, tenting it lightly with aluminum foil for the final 20 minutes of baking. Yield: 1 loaf. 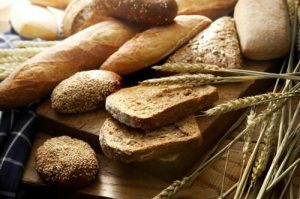 abundance, bread recipes, dog days of summer, harvest, Lammas. Bookmark.